After not diving for a few months we were all eager to get back in the water. The conditions at Flinders Pier were ideal, with only a light breeze and the water as calm as we could have wished for. 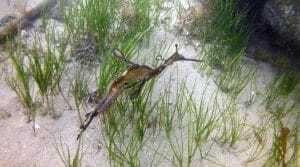 This was the first dive in Victoria for Laurice and Julie, and they couldn’t wait to see the Weedy Sea Dragons. Their wish was exhausted within the first few minutes of the dive, and to make it even better we got the chance to observe the very peculiar sight of the male sea dragons carrying their eggs under their tail. Everyone enjoyed the dive and can’t wait to go diving again as soon as possible.